Watch full Naruto Shippuden Season 20 Episode 25 English Dubbed full HD online. Naruto Shippuden Episode 438 English Dubbed online for free in HD. Shizune brings Tsunade dinner, and is startled by Tsunade’s outburst over Jiraiya’s depiction of Sakura. Her dinner is too salty, and her beverage is too hot, so Tsunade resumes reading. The masked man prevents Neji from coming to Sasuke and Sakura’s aid, assuring him he won’t let them be killed, insisting Neji watch the battle to witness their true selves. The masked man reminds Sasori of the mission and Sasori begins attacking Sakura, who manages to dodge and land one of her own, causing him to retreat. She proceeds to treat Sasuke, removing the poison in his system. The masked man tells Neji there is more to come. Jiraiya clears Naruto’s blocked tenketsu and Naruto asks him why he’s there. He explains he’s searching for someone and when he heard of what was happening, he had Minato transport him there using the sealing formula incorporated in Naruto’s seal. Jiraiya tells Naruto to try summoning a toad, but it fails. Jiraiya recalls Naruto’s training and Naruto recalls training with Minato. Jiraiya offers to weaken the Eight Trigrams Sealing Style a bit. Lee and Tenten stop running after noticing they’re no longer under attack. 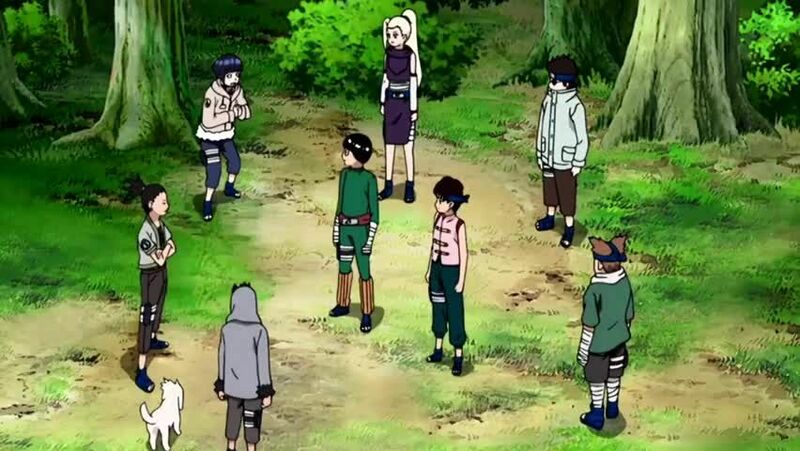 They’re met by Teams Asuma and Kurenai and update them on what has happened with Neji and Naruto. Kiba smells Sasuke and Sakura nearby, and Hinata spots Sasori near them. While Sakura heals him, Sasuke thinks back to his childhood. Sasuke looked forward spending time with Itachi, but Itachi was summoned by Minato, so he suggests Sasuke spend time with their father, who compares him unfavourably to Itachi when he tries the Fire Style: Fireball Jutsu for the first time. Sasuke detects Sasori, who approaches them again. Sasori brings out his hundred puppets. The other genin reach the two, and the masked man retreats with Neji. Sasuke intends on getting reinforcements from Konoha. Team Jiraiya watches from afar, discussing the situation. Jiraiya weakens Naruto’s seal, causing him to develop four tails.